The Texas QB situation is starting to clear up in a big way for the Texas Longhorns. As we all knew, Strong’s ability to build a future for this Longhorn program was going to depend on getting players to show toughness and improvement and finding and recruiting the state’s premier talent. But it was also going to depend heavily on getting the QB and OL in place for the team to have a contending-caliber offense in place for years 3 and 4. Contract extensions come from fielding good offenses that excite fans, not playing hard-nosed defense. Last February, realizing that Tyrone Swoopes could very well have a considerable role to play in the 2014 season as well as down the road, we did a write-up on where the young QB was in his development. Basically the take away was as follows. Physical tools? The limited freshman tape said Swoopes has value as a runner but isn’t particularly threatening due to lack of acceleration. Thus far in the 2014 season Swoopes has shown that he can use his size and athleticism to run some zone-read and present a credible restraint on the opponent as well as get yardage with the scramble if left lanes to exploit. On this play OU’s middle linebacker, Jordan Evans a rising star, is widening out at the snap and keeping his eyes on Swoopes all the way. When the ball arrives, Evans is all the way to the hash marks but it doesn’t matter, Swoopes’ arm strength beats him. If Oklahoma can’t stop Swoopes from completing throws like this against 2-deep coverages, then not many Big 12 teams will. TCU would be the next big challenger on this task. The best combination is when Swoopes is throwing the ball on rollouts, play-action, or scrambles when he can move around and threaten defenders with either the scramble or the pass. 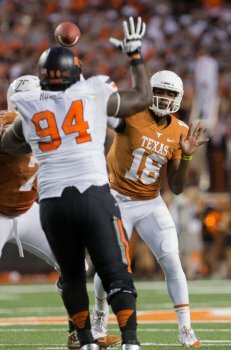 The next section of the article tackled where Swoopes was as a QB, namely how far had he come along in using his eyes, his footwork, maintaining accuracy, and handling pressure. Essentially, utilizing the skills to allow Ty to harness his physical tools. After the 2013 season, Swoopes was at a point where he was able to make use of his tools if confronted with very limited reads and possible outcomes. The furthest he got was in running plays where he would have a simple pre-snap read (if soft coverage, throw a hitch to the boundary) and a simple post-snap read (if not soft coverage, read mike linebacker, and throw or run). Making good use of Wickline and Koennings’ extensive experience with modern spread-option football, Watson then equipped Ty with dozens of plays that operated at this complexity level. Ty has to make a number of quick reads and decisions in this play. 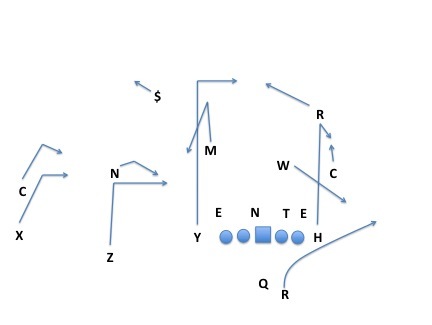 First, Texas uses motion to get OU to declare their intentions and to create leverage for the play. You’ll notice that after the motion, Ty peeks over at the boundary corner and sees the off coverage. Then then snap, Ty fakes the hand-off and looks to his pre-snap read to throw a quick hitch, but he no longer likes that read with OU’s OLB Geneo Grissom sitting in the passing window to rob his favorite route (the brothers Stoops scouted Ty pretty well for this game) so he has to make a hitch step and get to his 2nd read, a different concept on the other side of the field. 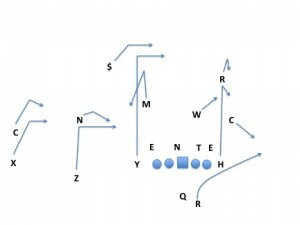 He turns and sees that Shipley has worked behind the linebacker, Dominique Alexander, who has over pursued the out route by McFarland. You can’t give Swoopes any time on these throws, he zips it in with enough accuracy to allow #8 to turn upfield and collect a first down. The best passing games these days, including systems like Watson’s, will give a QB two different passing concepts to either side of the field. 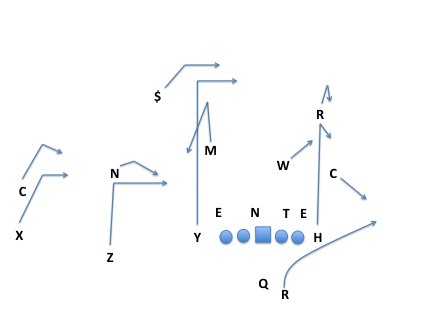 It’s up to the QB to read the deep safeties first, and then choose the concept on either side that best attacks the coverage, make the read, and throw the ball. Swoopes took a few steps against Oklahoma towards reaching that level, although currently Watson is mostly calling concepts where Swoopes already knows which side of the field he’ll be reading before the snap. Swoopes has also made tremendous strides in using his eyes. His ability to scramble is only made effective when complemented by the threat to throw the ball down the field and encourage wide-open running lanes. Swoopes’ keeps his eyes downfield even though the RB’s block on Eric Striker has really bought him a pretty limited amount of time. If you can keep your eyes downfield while Striker is coming after you, that’s about as real as it gets. In that Februrary article we broke down QB play into four tiers. Tier 1: A QB who is too limited to unlock a complete system of offense. Tier 2: A QB who can master a full system of offense. Tier 3: A QB who can dominate within a system. Right now? He’s still in Tier 1. Why? He’s struggling to throw the seam routes and he still needs growth in responding to the blitz. The favorite type of coverage that Baylor loves and that Iowa State and other opponents will bring against Texas in the coming weeks is quarters coverage. These teams will look to get safeties and nickelbacks involved in the run game as late, unblocked defenders that can ruin a play’s potential. 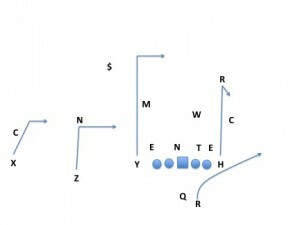 This play is designed to punish quarters safeties for the choices they make in defending trips formations. After the snap, Swoopes has to read the boundary safety (R) to see if he rolls over to help the strongside of the defense handle the trips set. If that safety opens his hips to the field, Swoopes reads the weakside on a “curl-flat” read. Presumably the corner carries the curl route by “H” and Swoopes needs to hit the RB on the checkdown route quickly before that weakside linebacker gets over and allows him to run after the catch. The more common response from Baylor was to keep that boundary safety on the weakside so that he could defend the curl and allow the corner to defend the flat. In this instance, Swoopes has to read the middle linebacker. If he drops with the dig route by “Y”? Swoopes throws to the in-route underneath and tries to hit that receiver on the run. If the middle linebacker allows the strong safety to cover the dig route without help? Swoopes throws the dig route. In this defense, Baylor (or any other opponent) trusts their strong safety to handle the dig route without much help inside. This is where you can really do damage against quarters coverage. But Swoopes couldn’t execute the concept against either Baylor or Oklahoma. He was often too hesitant in reading the mike linebacker to decide whether or not to throw the dig and when he did throw it, he was generally inaccurate. This is one of the better dig routes that Swoopes has thrown this year and it was low and behind Swaim, needless to say Texas’ best blocker was unable to catch it. Other attempts bounced off the ground in front of Texas’ Y receivers. Even the post route TD to Harris, shown above when Ty is ignoring Striker, isn’t as pinpoint accurate as Swoopes can be on his comfort throws outside of the hash marks. In order for Swoopes to graduate from Tier 1, he needs to be able to execute throws like this that allow Watson’s system to come alive and attack all parts of the field. 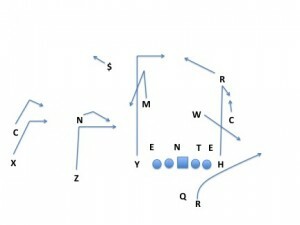 Ty also has steps to take in recognizing blitzes and responding quickly. Because his ability to make multiple reads on a play is coming along slowly, being able to recognize a blitz and throw quickly to a hot read is one of the last skills for Ty to hit on his checklist. On this play, Ty basically panics and flings the ball downfield when he actually has time to step into the throw, possibly without even getting hit as a result, or he might have rolled out to his right and potentially punished OU with a scramble or throw. However, it will become essential that Ty masters the art of handling pressure when teams decide to stop defending Texas by playing “bend don’t break” and allowing execution errors to kill drives and instead start attacking Swoopes with the blitz. The future for Texas at QB looks a lot better than it did even a week ago. Swoopes’ performance against Oklahoma was great with nearly 400 total yards of offense and a new record in the history of the Red River Shootout. There are still steps for him to take to be able to unleash everything that Watson can think of for destroying Big 12 defenses. However, there’s now reason to believe that Swoopes’ progression as a QB might take him into the higher tiers of QB play. His reads and decision-making can only get faster as he sees more and more defensive responses and continues to add steps and throws to his muscle-memory bank. 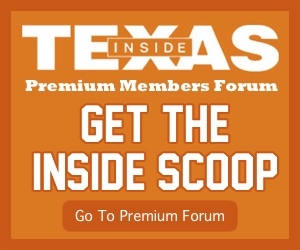 Strong’s sales pitch for Longhorns football is likely to be a beneficiary as Texas continues to lay the foundation for a team that might be pretty salty in 2015 and 2016.